Traditional Bulk Ink System with permanent chip. Available in 4/6/8 colors. Formulated as a "pour and go" solution for users of original Mimaki JV3, JV33 and JV5, Mutoh and Roland inks. The color and physical properties of the ink have been matched so that existing color profiles and printer settings can be used. Refillable cartridges come with one pre-made slot for the chip. 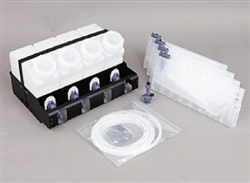 The refillable ink cartridges come with pre-made refill holes, and funnels for easy refilling. Durable, transparent ink tanks give users a direct view of ink levels. Mutho: RJ4000, RJ6000, RJ301C, RJ-900, VJ-1604W, VJ-1204, VJ-1604, VJ-2606, and more. Roland: FJ-740, FJ-540, FJ-500, FJ-600, FJ-400, SJ-640, SJ-740, Soljet Pro III XC-540, VersaCAMM VP-540 / 300, VersaCAMM SP-300 / SP-540, and more. Copyright © ChromaXpress,LLC dba Solventprintersupplies.com.